The LUMii DIGITA ECO Ballast is a fully electronic ballast. This technology is micro-processor controlled and works at higher frequency (hertz) than the standard magnetic ballast meaning more light gets to your plants. It is also more efficient meaning more output per watt of energy consumed. The LUMii DIGITA ECO Ballast is dimmable and also has a boost setting for each lamp size meaning you can take control of the light output. With the new LUMii DIGITA ECO Ballast less wattage is lost in the transmission of power from the wall socket to the lamp. Better power management means more light to the plant and less energy consumed. The quality of the light produced is also a lot more stable thanks to the LUMii power management software built into the unit that monitors for lamp degradation and power fluctuation from the grid. This produces a higher hertz rate and optimum light levels. The lamp is very quick to ignite and uses less power at the ignition stage and gives your plants a full spectrum light source within 5 minutes (magnetic ballast technology takes up to 20 minutes for the lamp to come up to full brightness). 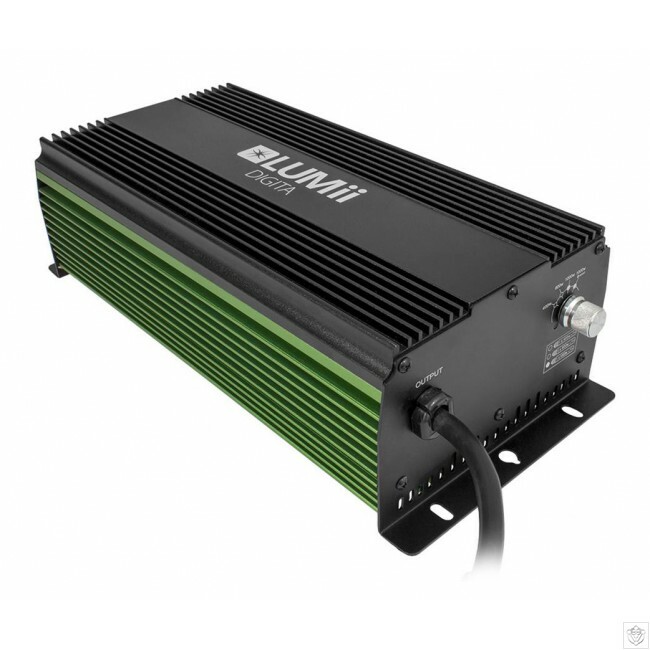 The LUMii DIGITA ECO Ballast is one of the quietest ballasts on the market with no hum or vibration (this is common with magnetic or fan cooled electronic technology) and is very lightweight. The LUMii DIGITA ECO Ballast has safety features built in that protect the unit's circuitry if a short is detected. When the ballast detects an abnormal input or output voltage due to an old or damaged lamp it will not ignite the lamp. This ballast is resin covered on the inside which helps to protect against dust ingress to the components and creating even heat distribution meaning that there is no need for a fan.